ST. GEORGE – After 15 years serving in the Utah Legislature, Sen. Urquhart announced earlier this month he wouldn’t seek re-election. Following the announcement, Rep. Don Ipson, R-St. George, announced his intent to run for Urquhart’s Senate seat. During the event, Rep. V. Lowry Snow, R-St. George, said Ipson has a long history of leadership and involvement in the House. Ipson has been treated extremely well by his colleagues in the House, he said, adding he has also developed a good relationship with members of the Senate while in office. 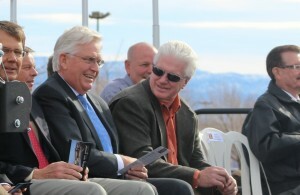 “I think I’ll be able to pick up where (Urquhart) left off and make a difference for the people of Southern Utah,” Ipson said. Ipson currently represents House District 75, which was also previously held by Urquhart before his move to the Senate. Ipson has served in the Legislature since 2009. House committees Ipson has served on include the House Law Enforcement and Criminal Justice Committee, House Political Subdivisions Committee, Infrastructure and General Government Appropriations Subcommittee, Law Enforcement and Criminal Justice Interim Committee, Political Subdivisions Interim Committee and State Water Development Commission. He has also served as majority assistant whip in the House. Outside of the Legislature, Ipson is the president and CEO of DATS Trucking, a freight transportation company he founded in 1988. He holds a degree in accounting and business administration from the LDS Business College and is a past president of the Southern Utah Trucking Association, Utah Trucking Association and Washington County Economic Development Committee. He lives in St. George with his wife, JoAnn. Ipson will be able to officially file for candidacy in March. The Washington County Republican Party nominating convention is slated for April. Good for you Big Don! We couldn’t ask for better representation, and I’m betting that you won’t sell your constituents out!